5 Reasons to Use Natural Décor This Holiday Season! I challenge you to get festive with the flora that waits outside four walls to deck your hall! Smells and Looks Gorgeous. Evergreen trees and shrubs are the most obvious form of décor this time of year—and they do not disappoint in their beauty, ability to fill a space, and wonderful aroma. Fill the vases with them. Have your friends over to make wreaths, swag, and mistletoe; or buy them from several local charities that sell them in a variety of decorative forms each season. Look to your local grocer, or even better your garden for culinary inspired décor: mandarins punched with cloves, a basket of pomegranates or artichokes, fresh sage or cinnamon sticks tied around a white candle with kitchen string, a simple wreath of rosemary…tap into your creativity here—the possibilities are endless. Fun to Source. Pull on those Hunters, top off your Yeti with a toddy, and forage with friends! Sourcing natural décor is also particularly a lovely thing to do with small children who will love filling up buckets with pine cones and other natural treasures. It’s truly amazing what you can find in your back yard. Live in the city? Pool your friends. Someone will most likely have friends or family that will be more than happy to let you trim their trees. No Storage Required. 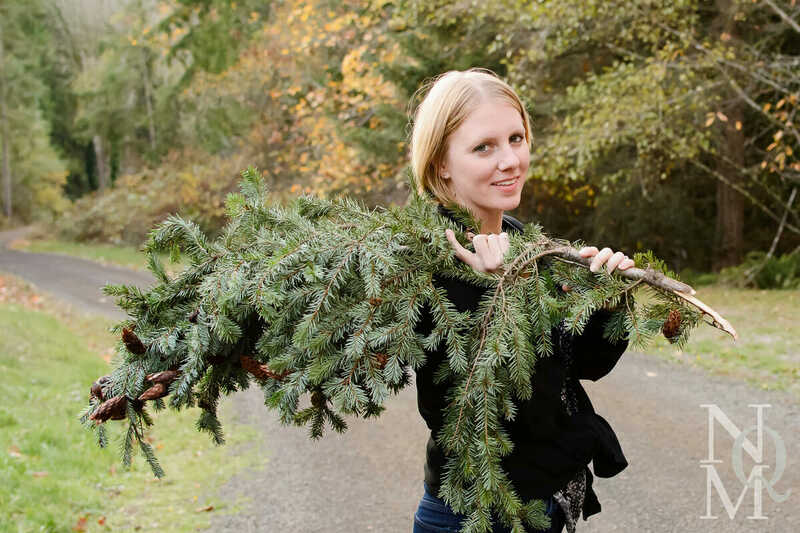 Faux foliage—be it a tree, wreath, or garland—take up a ton of space. This is why they pack such a punch when found from nature. It also makes them a nightmare to store. So, in these times where the cries to simplify our lives are ringing like the bells on Christmas Day, do we really need to rent a storage unit to store our holiday décor? And I know hoarding these bulky things is completely out of the question for you urbanites who are storing your shoes in the stove. When the time comes to undeck the halls, simply ditch the décor in your yard waste bin, or even better use it as mulch or compost. Budget-Friendly. Foraging for foliage is obviously great on the wallet, and there is never a better time to save a few pennies than the holiday season. Simply divert your eyes from those enticing aisles that scream “winter wonderland” in lieu of the real winter wonderland that lies outside your door. And even those all-natural items you do buy, such as a bag of mandarins, a jar of cloves or cinnamon sticks, or a bunch of herbs, are nothing compared to the bill you’ll get at your favorite big box store. Environmentally Friendly. As previously mentioned, natural décor need not go a-wassailing to the landfill. It can simply be tossed in the compost bin or used on your own garden beds as mulch through the chilly winter seasons. Think of all the (most-likely) foreign-produced materials that have been fueled over from so far to be used briefly, then stored the rest of the year. Avoid the engineered materials and the often environmentally-dreadful packaging. Simply visit the produce aisle of your local store, or better yet your backyard!